While young City men reportedly wore black armbands for someone who never lived, his creator, Arthur Conan Doyle, was reeling from horrible news of his own. That October, his wife Louise (affectionately known to her family as “Touie”) had been diagnosed with tuberculosis. Her case was advanced, and it was terminal. Whatever future they had envisioned for themselves and their young family was now irrevocably changed. There would not be, after all, another Louise. One common 19th century treatment sought by tubercular patients who could afford it was a move to higher altitude, in the belief that the lower air pressure would allow the heart to work more effectively and therefore help to clear the lungs. ** Following this line of thought, Conan Doyle spent the next few years moving his family to Switzerland and Egypt in hopes of improving his wife’s health. While it seemed to bring results, all of the moving and living in hotels was expensive and disruptive to the couple’s children, Mary and Kinglsey. 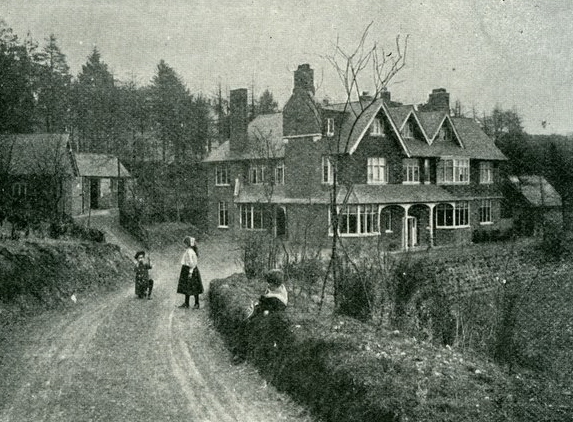 Fortunately, in 1895, a family friend and tuberculosis sufferer, Grant Allen, told Conan Doyle that Hindhead, in Surrey, was elevated enough to have a beneficial climate. Never a man to waste time, the author bought a piece of land and in October of 1897, the family moved into their new home, Undershaw. Alistair Duncan, who has previously described Conan Doyle’s years in Norwood and traced his (and Holmes’) connections to places in London, now turns his knack for painstaking research to Undershaw. He combines great events with small to give the reader a detailed picture of the author’s life over the next decade, one of tremendous change for him, both personally and professionally. One of the most important events in Conan Doyle’s life, and that of his family, occurred while Undershaw was still being built. On March 15th of 1897, he met 23 year-old Jean Leckie. Although still married, he fell hard for the aspiring opera singer and began an intense platonic relationship (a courtship, really) with her that would last throughout his time at Undershaw and would ultimately be the cause of his leaving it. 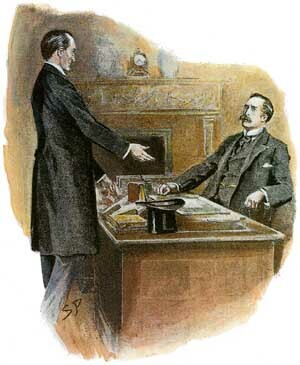 Professionally, Conan Doyle still found himself tied to the man who had given him a career. Holmes may have been gone, but he was definitely not forgotten. Shortly after the family moved, the Sherlock Holmes play which had consisted solely of rumors became reality. Duncan details the negotiations, pitfalls (including a rewrite necessitated when the only copy was destroyed in a hotel fire), and the play’s ultimate success–provided that the audience could actually hear the actors. It was this project that lead Conan Doyle to write the frustrated exclamation beloved and used by pastiche writers everywhere, “You may marry or murder or do what you like with him!”*** Interestingly enough, he wasn’t quite serious about this; Duncan writes that one issue Conan Doyle particularly wanted to discuss with Gillette when they met in May of 1899 was the actor/writer’s plan to give Holmes a romantic interest. We know he did, of course, but apparently there were boundaries to the character that his creator was not willing to cross. Never one to hide away in his study, Conan Doyle was quick to get involved in local, national, and international affairs. His concern with British politics led him to write letters, articles, and occasionally run for office. It also led him to serve in the 2nd Boer War as a medical officer. In February 1900 he sailed to South Africa, where he served as Secretary/Registrar for the Langman Military Hospital in Blomfontein. He wasn’t there long, but by the time he left, in July of that year, he had written articles, a decent portion of his definitive book on the war and, on the steam ship home, met a young journalist, Bertram Fletcher Robinson, who would, although he didn’t realize it, be instrumental in bringing Sherlock Holmes up out of that chasm and making him eternal. I have always admired people who set out to write biography. When you write fiction, you’re in charge. Of course you write what you see, what you know, what your characters tell you to write…but ultimately, your book is yours to make up as you go along. Historians have to deal with facts (or at least they should), but typically they have a multitude of events, people, and sources to work with. Don’t have the material for one angle? Choose another. Do the Boston Massacre witness accounts conflict?✝ That’s all right–you have room, and you can even make that your thesis. A biographer, however, is limited to the facts that exist about one person in particular. If the source material isn’t there, it’s just not. He can’t make up the facts. He can’t make the person into someone he wasn’t. And when the biographer chooses a limited time in his subject’s life to examine, it can be difficult to piece all of the events from that briefer period together into a cohesive whole, particularly when some years are more eventful than others. In An Entirely New Country, Duncan achieves this admirably, and the result is a valuable resource, or a nice introduction for anyone who has yet to read a complete biography of Arthur Conan Doyle. We get a full view of Conan Doyle’s Undershaw years, almost as if we were his nosy next-door neighbor. He’s playing golf again–when will that Hindhead Golf Club be successful? Is that a new car? He surely is a speed-demon. Did you read about his first-class wicket against W.G. Grace? The Rifle Club’s shooting at the range over at Undershaw, perhaps you should join. Who’s that with him now–is it that woman? I wonder what Louise thinks about her. Is it true he’s writing about Sherlock Holmes again? This time, however, the nosy neighbors have plenty of photographs, a bibliography, helpful footnotes and supplemental information about the people in Conan Doyle’s life, such as Charles Frohman and George Edalji. Particularly enjoyable are Duncan’s own, often wry, observations. He looks at his subject with a clear eye. When Conan Doyle comments on a fellow medical officer’s weight (he appears to have disliked the man), for example, Duncan points out that in photographs, the gentleman looks to have had the same type build as Conan Doyle himself. He provides interesting speculations on individuals’ feelings, motives, and events, and is careful to identify them as such.✝✝ What, for instance, did Strand editor Herbert Greenhough Smith think when he realized that Collier’s Norman Hapgood managed to get the stories he’d been angling for for years? Was it printable? Duncan also doesn’t succumb to the biographer’s temptation to take his subject’s side in every matter. Everyone can acknowledge that it had to have been very difficult to live with the changes tuberculosis forced upon his family life, but not all of Conan Doyle’s coping strategies were beyond reproach and, as Duncan points out, some of his actions caused pain (to which he seemed oblivious) for both his immediate and extended family. Duncan is also perceptive in pointing out that, while Doyle’s marriage to Miss Leckie, after the period of mourning for his wife had been fulfilled, brought him happiness and a new beginning, it did not do the same for his children. Because life, after all, is not a story, and we don’t get an Empty House. Don’t faint again, Watson, but Undershaw is in danger, and we’ll need more than brandy! That being said, An Entirely New Country was written with a resurrection in mind. As most of you no doubt know, Undershaw, now the only extant home of Conan Doyle, has fallen into a state of terrible disrepair and is now in danger of being broken up into flats. The Undershaw Preservation Trust has been working tirelessly to prevent this, and to find a way to preserve Undershaw as a single dwelling. For more information on the Trust, its goals, the legal battle it faces against development, and ways in which you can support its efforts, please see http://www.saveundershaw.com/. Alistair Duncan has also pledged that 50% of the net royalties of An Entirely New Country should go to the efforts to save Undershaw. In my own efforts to support the UPT and fill your bookshelves, I’ll send a copy of An Entirely New Country to the first two commenters. Already have a copy? You can have your choice of one of Duncan’s other books, or an item from the UPT shop of equivalent value. An Entirely New Country is available on the Baker Street Babes and MX websites, the Save Undershaw shop (on the Trust’s website) and, of course, your usual online booksellers. *As we mentioned in the last review, Sherlock Holmes had quite a few imitators, and some predecessors. Fans could get their deduction fixes from Poe’s Dupin, Gaboriau’s Lecoq, Barr’s Eugene Valmont, Grant Allen’s Miss Cayley, and many, many others. **First promoted by German physician Hermann Brehmer in mid-century. The family’s efforts to prolong Louise’s life were successful; however, she eventually succumbed to the disease on July 4, 1906. ***Honestly, some of us should have that embroidered on a pillow and displayed prominently in our sitting rooms. ✝Ohhhh, they do. To an insane degree. ✝✝One thing he does not speculate on is some kind of murder conspiracy or any ill-will between Conan Doyle and Bertram Fletcher Robinson. Duncan’s evidence that the men remained on good terms throughout their friendship is conclusive. Great review. Given what is going on (sadly) with Undershaw now, I hope this book gets widespread attention. Nice review. I have been intending to read it and may just break down soon! Interesting review. Enjoyed very much the background on this biography.